Goosefraba.. What does it mean? It is a soothing sound Eskimo mothers would whisper in order to sooth their young ones. Have you seen the movie "Anger Management" with Jack Nickelson and Adam Sandler? There's a part there where one in the anger management class speaks the word "goose fra-ba" over and over (kind of like a zen thing) to bring him back down and calm his nerves. 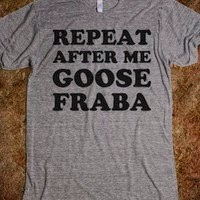 Well I've been doing my own version of goose fraba-ing. So, when things go wrong as they sometimes will, when you're upset, depressed, when you figured in an untimely and unanticipated breakup, or simply feeling fear, anxiety, despair, guilt, apathy, grief, or what many people would describe as typical "sadness" or other negative emotions, try to relax, close your eyes, take a deep deep breath and while you slowly exhale, say "GOOOOOOOOOSE FRABA" Do this at least five times and feel differently. 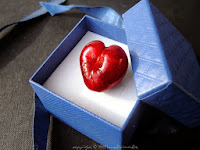 Love is passion, obsession, someone you can't live without. If you don't start with that, what are you going to end up with? Fall head over heels. I say find someone you can love like crazy and who'll love you the same way back. And how do you find him? Forget your head and listen to your heart. I'm not hearing any heart. Run the risk, if you get hurt, you'll come back. Because the truth is, there is no sense living your life without going thru this. To make the journey and not fall deeply in love - well, you haven't lived a life at all. You have to try. Because if you haven't tried, you haven't lived. Stay open. Who knows? Lightning could strike.